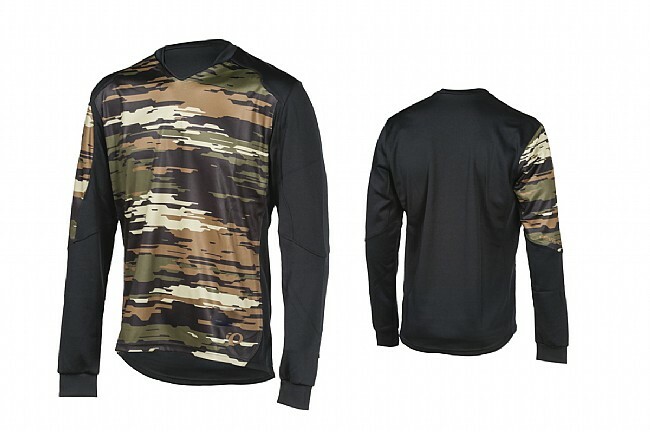 Pearl Izumi's Launch Thermal Jersey features a stylish camo print and winter-weight Thermal Fleece fabric to set the tone for off-season mountain biking. The V-neck collar sits low and out of the way while riding, and a built-in sunglass wipe on the inner hem is convenient for wiping away any of that wet, winter weather. Warm jersey even when wet. The fabric is still stretchy enough to fit over light protection if you are going to use some making the sizing true. Terry cloth hidden under the left bottom cuff is great for wiping crud off your glasses.